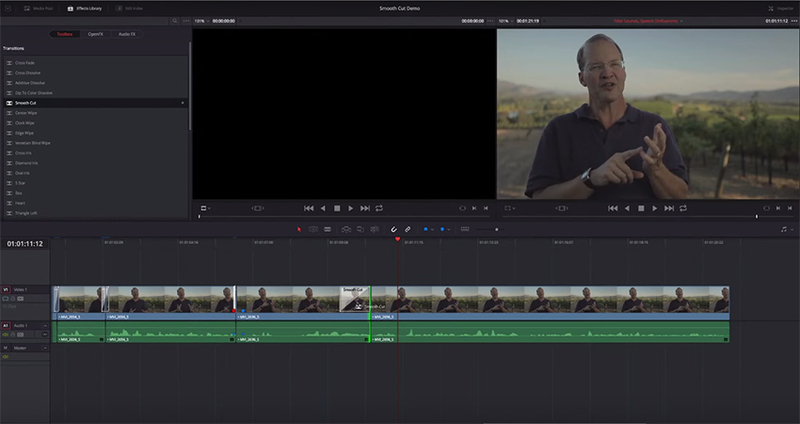 The latest release of the Blackmagic Design’s leading post-production software DaVinci Resolve 12 is now an even more powerful non-linear editing platform than its previous iteration with full blown NLE features, which will speed up your workflow. Now you can seamlessly and effortlessly enhance your editing only by using the latest features the application comes with. Among the plethora of the recently added tools, you will also find the Smooth Cut. The results one can get with it are similar to what you can achieve with the Morph Cut in Premiere Pro CC 2015 as it’s another great tool to improve the edits of your interviews by tightening up unwanted pauses and other speech disfluencies, especially when you don’t want to use additional B-roll footage to smooth out your edit. In the following video produced by Ripple Training, we’ll see what type of results you might expect from this particular workflow in practice. To apply the effect in DaVinci Resolve 12, after trimming out your edit, navigate to the Effects Library where you’ll find the Smooth Cut. Simply drag and drop the transition over the cut between clips and adjust its duration. One of the major considerations you should bear in mind though to get the optimal results is to make the transition only two to four frames long. Furthermore, try to look for relatively short, logical gaps and natural pauses between your interviewee’s phrases with reasonably similar head placement and base your cut around that if possible. Otherwise, the transition simply won’t work as flawlessly and seamlessly as you might expect so take that precaution in mind. In fact, this newly added feature uses the proprietary DaVinci optical flow algorithms to create a seamless transition between different parts of an interview so you don’t have to cover jump cuts with additional footage. Supposedly, you shouldn’t expect perfect results in every situation, especially when there is a lot of movements such as hand gestures or upper body movements involved in different parts of the frame. All in all, the Smooth Cut is another great tool that every editor has to have in his/her arsenal with editing tips and tricks. Kudos to Blackmagic Design for pushing the boundaries of the industry’s status quo once again by developing this enhanced hybrid post-production platform. By paying close attention to even the smallest details, they enable creative professionals to deliver top-notch results every time working on a project, regardless of the requirements and challenges they need to handle.